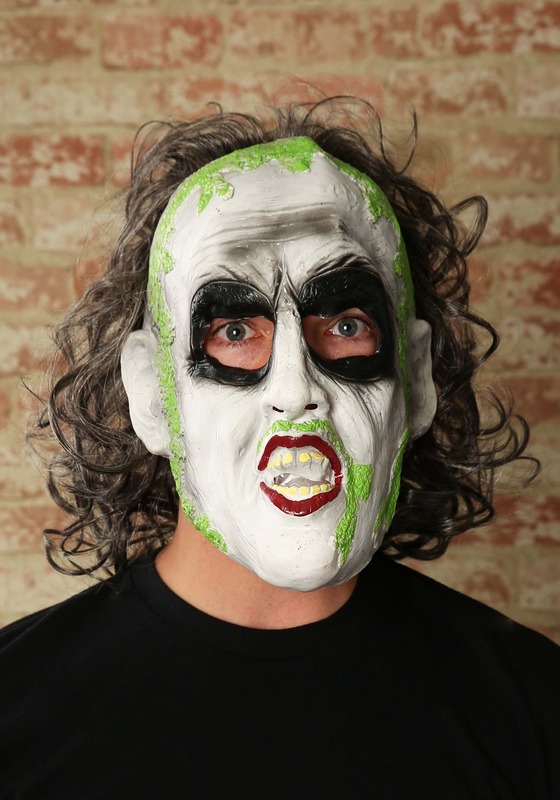 Invoke the name of Beetlejuice when you go in this deluxe Beetlejuice mask! This 3/4 mask is made of vinyl and features Beetlejuice's white face, with black around the eyes, bad teeth, green markings under the nose and around the mouth and along the hairline. This mask has holes for the eyes, nostrils, mouth, and ears (Note: eyes are hollow, unlike pictured). The wig portion of the mask is attached to the back half of the mask and includes mesh netting with elastic. The wig is black and silver hair (Note: wig is black and silver and not green tinted as pictured). This Beetlejuice mask and wig will look great with our Beetlejuice costumes!